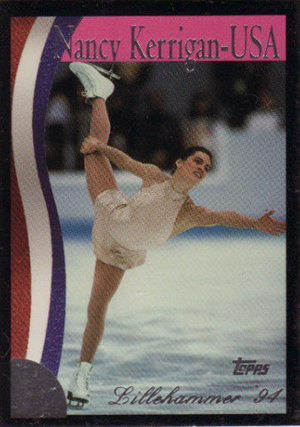 In retrospect, 1994 Topps Nancy Kerrigan My Diary trading cards are one of the strangest sets every produced by a major company. You can't fault the card maker for jumping at the opportunity to make a set with the figure skater's blessing and participation. She enter the 1994 Winter Olympics with massive amount of attention from being attacked in the lead up to Lillehammer. Today, though, the approach of the set is just seems weird. At the same time, it's hard to look away. 1994 Topps Nancy Kerrigan: My Diary has an 88-card checklist. About half of it is dedicated to national and international competitions leading up to and including the 1994 Olympics. Theses cards are what you'd likely expect from a set of Nancy Kerrigan trading cards. But things get a little strange in the other half of the set. 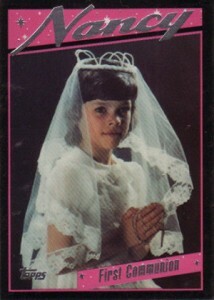 We learn about things like Nancy's first communion. We get a look at her prom dress. And then there was that time Nancy hung out with Santa Claus in his sleigh -- in her skating gear. It's personal candid shots like these that give the set its overall tone. You can find in-action shots in other releases. 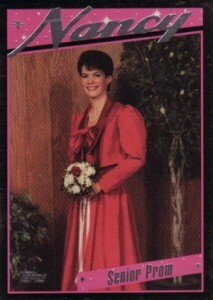 Where else are you going to get to see Nancy Kerrigan in a communion dress or getting ready for the big dance? At the same time, it offers a more intimate, down-to-earth look at the Olympic silver medalist. Produced in direct partnership with Kerrigan, card backs are written in the first person as if Nancy were writing in an actual diary. Even the design is intended to look like a diary page, complete with tacky "hand-writing" fonts. It's not surprising that Kerrigan's attack and Tonya Harding aren't directly confronted in the set. At the time, the cards were considered more on the premium side for such a release. They're glossy with silver foil for both the header and the caption on the front. 1994 Topps Nancy Kerrigan: My Diary isn't all that common on the secondary market. It can be found, but not in mass amounts like many other sets from the era. It's also not terribly expensive as Kerrigan soon faded from the spotlight following the Olympics. The fact that there are no inserts certainly doesn't help the excitement either. These aren't the only Nancy Kerrigan cards. 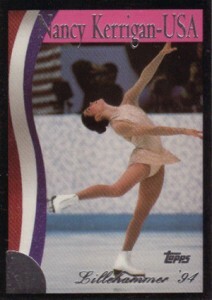 In 1996 she was featured in an Olympic set from Upper Deck. Her first certified autograph was included in 2009-10 Upper Deck Series 2 Hockey's The Champions. She has several other autograph cards including 2014 Topps US Olympic Hopefuls and a dual autograph with Tonya Harding in 2013 Leaf Pop Century. 1994 TOPPS NANCY KERRIGAN COMPLETE 88 CARD SET RARE !! 88 cards. Shop for sets on eBay. 47 For the Fun of It!